Presidential Decree No:5 of which name is Presidential Decree as to the State Inspection Institution regulates (article 1) that Turkish Presidency has authority to inspect Bar Associations, Professional Organizations, Trade Unions, Chambers of Commerce, Employer and Employee Unions, Association and Foundations. Moreover, any senior inspector of the D.D.K. would be able to suspend the chairperson, and the board members of the aforementioned entities should the inspector decides that it is necessary for the soundness of the inspection or the public weal. Three international law associations made a submission to the United Nations Special Rapporteur on the Independence of Judges and Lawyers and urge the UN to enter into urgent dialogue with the Turkish government with a view to ending the persecution and prosecution of legal professionals in the country. In the United Nations 39th Human Rights Council, the Lawyers’ Rights Watch Canada (LRWC), Lawyers for Lawyers (L4L), The Law Society of England and Wales (TLS) urge Turkish Government to stop human rights violations. Afyon Public Prosecutorial Office has been prosecuting 14 lawyers, of those 10 have been arrested and six of those have been convicted. 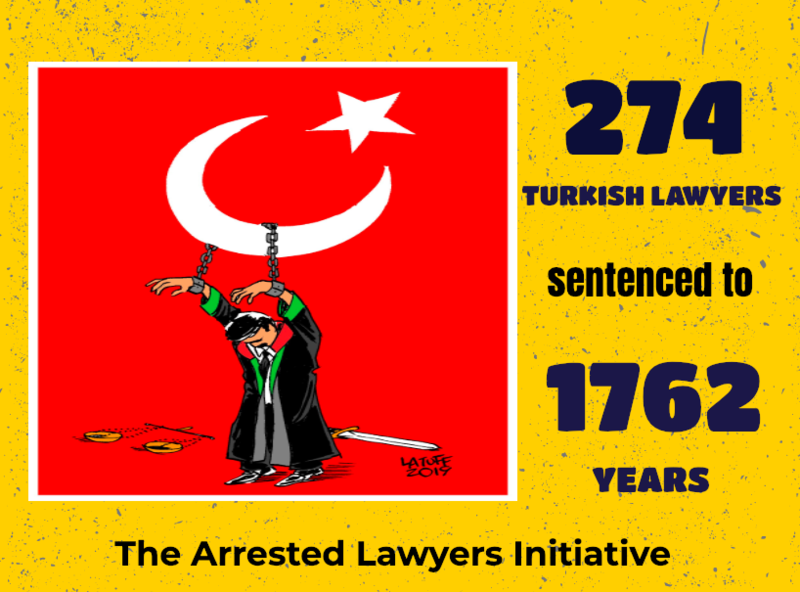 So far, in Turkey, 169 lawyers have been sentenced of terrorism related accusations. According to our survey carried out on the Turkish Justice Ministry’s statistics of their operations in the last five years, there is a steady increase in the use of anti-terrorism law on individuals by public prosecutors. So, while 8,324 people were indicted under Article 314 of the TPC in 2013, 146,718 people were indicted under the same Article in 2017. According to our survey there is a steady increase in the use of anti-terrorism law on individuals by public prosecutors. So, while 8,324 people were indicted under Article 314 of the TPC in 2013, 146,718 people were indicted under the same article in 2017. Statistics highlight that Turkey has indicted 221,366 people with the charges of being member or leader of an armed terrorist organization within last five years. Statistics also indicate that, in 2017, Turkish prosecutors have opened investigations against 527.154 individuals on suspicion of the crimes against the Constitutional order. So far, in Turkey, 162 lawyers have been sentenced of terrorism related accusations, and mainly of being the member of an armed terrorist organization. Twenty one of those who have been sentenced are member of the Istanbul Bar Association. Istanbul Public Prosecutorial Office has been prosecuting 503 lawyers, of those 147 have been arrested and so far at-least twenty one members of Istanbul Bar Association have been convicted. The Open Dialog Foundation published a report that examines cases of harassment and attacks on lawyers and attorneys. In the report entitled ‘Defence for Defenders’, cases of lawyers Fevzi Kayacan, Cemalettin Ozer and Mehmet Guzel who are former presidents of Konya, Erzincan and Erzurum Bar Associations were presented. Data and reports that compiled and published by The Arrested Lawyers Initiative quoted in the report. The International Bar Association’s Human Rights Institute, the Law Society of England and Wales, the Bar Human Rights Committee, the Union Internationale des Avocats, Lawyers for Lawyers, and Lawyers’ Rights Watch Canada made a joint oral statement regarding persecution of Turkish lawyers at United Nations 38th Human Rights Council after Diego García-Sayán presented -UN Special Rapporteur on the Independence of Judges and Lawyers- his annual report. The fact sheet entitled “Challenges to the Independence of the Legal Profession under the State of Emergency in Turkey” was prepared by a delegation of six Turkish lawyers including four The Arrested Lawyers Initiative members, the International Bar Association’s Human Rights Institute, and The Law Society of England and Wales.